Every major tech company is looking at quantum computers as the next big breakthrough in computing. Teams at Google, Microsoft, Intel, IBM and various startups and academic labs are racing to become the first to achieve quantum supremacy — that is, the point where a quantum computer can run certain algorithms faster than a classical computer ever could. One of the major issues that all quantum computers have to contend with is error rates. Quantum computers typically run at extremely low temperatures (we’re talking millikelvins here) and are shielded from the environment because today’s quantum bits are still highly unstable and any noise can lead to errors. Because of this, the qubits in modern quantum processors (the quantum computing versions of traditional bits) aren’t really single qubits but often a combination of numerous bits to help account for potential errors. Another limited factor right now is that most of these systems can only preserve their state for under 100 microseconds. The systems that Google previously demonstrated showed an error rate of one percent for readout, 0.1 percent for single-qubit and 0.6 percent for two-qubit gates. Google’s announcement today will put some new pressure on other teams that are also working on building functional quantum computers. What’s interesting about the current state of the industry is that everybody is taking different approaches. 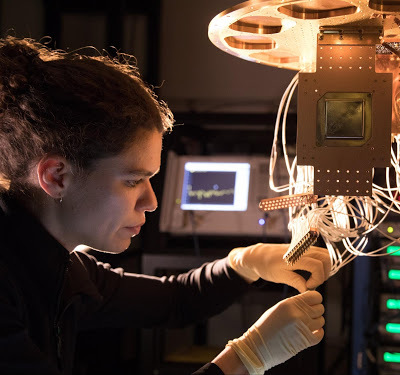 Microsoft is currently a bit behind in that its team hasn’t actually produced a qubit yet, but once it does, its approach — which is very different from Google’s — could quickly lead to a 49 qubit machine. Microsoft is also working on a programming language for quantum computing. IBM currently has a 50-qubit machine in its labs and lets developers play with a cloud-based simulation of a quantum computer.